My scrapping has really slowed down now that the twins are in a big bed. I've lost about 3 hours a day of "me" time due to earlier wakeups, shorter naps, and later bedtimes. I'm sure in time it will straighten itself out, but now I'm still adjusting to being tired again, so there are some days all I get done is check e-mail and other critical tasks, and never make it to my scrapping. I miss it. This LO doesn't strike me as one of my best, but its ok. A month ago I had never used a B&W photo, now I think I have done three LOs with B&W. Odd - but on this LO it really helped tie the pictures together because they were all different colors and it was hard to find papers that worked for everything, so changing them to B&W fixed that issue. I'm also trying to challenge myself by using a single kit, in this case a mini-kit. I think it helps me better understand what people might want in a design. This is also a color combo that I normally wouldn't use, and it was a good test to feel a little uncomfortable. Now for the my latest freebie kit - sorry its taken so long. It's been ready for a few days, but with our swingset project this weekend I just didn't have a chance to get a LO scrapped and my DH is traveling out of the country this week. I'd like to say a big THANKS to those that left comments with the last kit, and especially those who left comments between freebies - those truly warm the heart. Please, if after you open the kit, you think "Darn, I could use this if it just had _____", then come back and leave a comment and I'll try to put together an add-on with the requests. I could always keep adding to a single kit, but I don't want to put all my design eggs in one basket. This weekend is the twins 3rd birthday - they are so excited - they ask every day to go pick up the birthday cake! Hopefully I'll get lots of good pictures this year. 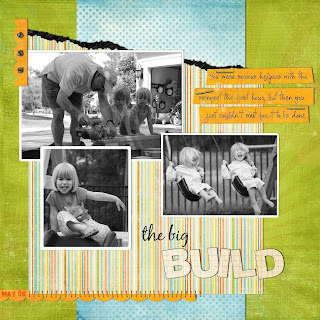 Sarah, I LOVE LOVE LOVE your "the big build" pages. They are perfect. I love that color scheme. Everything doesn't have to be "girly"...The colors go so well with the theme. And another freebie? Girl, no wonder you are tired!! THANK YOU! Thank you for sharing your sweet mini kit! I love the colors. You swing set page is great, and I really like the B&W photos. Happy bday to your twins. Sarah B. you're always so good to post credits in your TOU and I for one Thank you immenseley for that. Love this kit too, cute cute color scheme! I'm getting ready to download all your freebies. They're all so wonderful but I don't have time to comment on each and every one of them. I'm so glad you're going to be a part of Benevolent Boutique, your designs are very inspiring.